Creativity. Style. Innovation. These are the qualities that define the elegant new ZenBook 14. Everything in this take-anywhere masterpiece - it's the world's smallest 14-inch laptops* - is designed to give you the freedom to discover your creative power, including its breathtaking frameless NanoEdge display. You'll appreciate not only the tremendous power within and the thoughtful attention to detail - such as the exclusive ErgoLift hinge and NumberPad touchpad - but also the timeless beauty of the design, with its sensational Royal Blue or Icicle Silver finish enhanced by the new Rose Gold trim panel. ZenBook 14 is waiting: are you ready to unleash your creative power? Designed to give you the most screen area in the least physical space, the new frameless four-sided NanoEdge design of ZenBook 14 is simply breathtaking: it makes any visuals more immersive, with less distraction for your eyes. The ultraslim bezels1 are just 2.9mm thin at the sides, 3.3mm at the bottom and a mere 6.1mm at the top to accommodate the camera. The effect is truly stunning - it's like an infinity pool for your eyes! 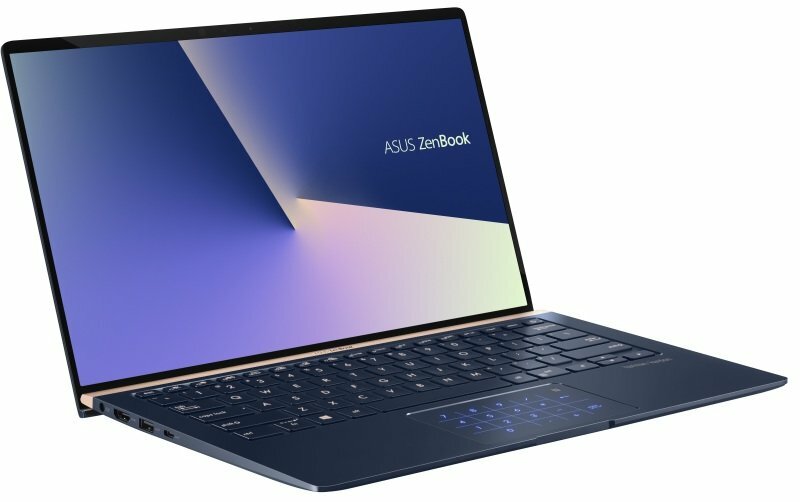 And with this ultra-compact display, ZenBook 14 is only about the size of an A4 sheets - smaller than many 13.3-inch laptops. With any ZenBook, your comfort is one of our top priorities. ZenBook 14 goes the extra mile with its exclusive ErgoLift hinge, an engineering masterpiece designed to automatically tilt the keyboard to the most comfortable typing position. But that's not all: the carefully calculated tilt improves cooling and audio performance, too. As a mobile professional, you need to stay connected - at the fastest speed possible. ZenBook 14 is equipped with gigabit-class Wi-Fi and ASUS Wi-Fi Master technology, so you can enjoy ultrafast downloads and smooth streaming with greater range and more stable network connections than ever before. Additionally, the latest Bluetooth® 5.0 brings you all the benefits of the latest low-power peripherals and accessories. ZenBook 14 is powered by a high-capacity battery that won't let you down, however long and demanding your working day is. Extended journeys or day-long meetings are no problem for ZenBook 14, even when power outlets are in short supply!